These kitchen-to-table sets of stoneware nesting bowls offers unique scoop-style handles and narrow spouts. 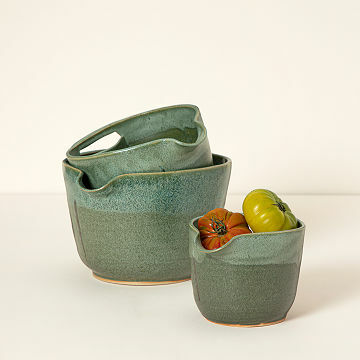 Beautifully crafted from stoneware clay by Maggy Ames, these nesting bowl sets seamlessly take you from prep work to tabletop. Unique scoop-style handles integrate with the narrow spouts, so you can easily pour batter, serve gravy, or portion side dishes from one set of bowls. Accented by a rustic speckled finish, these charming bowls are oven and microwave safe--lending eye-catching efficiency to your dinner party. Handmade in New York. Pottery is a second life chapter for Maggy Ames. At Skidmore College, she watched enviously as classmates immersed themselves in clay. She completed law school, and practiced in New York City for 35 years, representing people with developmental disabilities. Maggy kept a pottery studio on the side, her haven of peace and quiet, and eventually became a full-time potter. She and her partners operate one of the few remaining working clay studios in Manhattan. Microwave, dishwasher and oven safe. Do not place in pre-heated oven. These bowls are so beautifully made. The coloring is so earthy and they are a substantial weight, not in a heavy way, but in a well-crafted way. I especially like the cut out at the top that makes for a creative way to hold the bowl with your thumb in the cut out for easy pouring. They are stack perfectly, although, I imagine mine will be out on display whenever they are not in use. Up until very recently I would've given these bowls 5 stars. I ordered them in June after we moved into our new house, and I wanted a nice set of prep/mixing bowls. I use them frequently when baking and for holding chopped vegetables when cooking. The other week I was tipping chopped onions out of the small bowl into my pot when the handle snapped off and the bowl fell into the pot. I read the reviews about the handles snapping when storing them, but this was when I was using it...the handle broke off either end and in the middle. Now I'm too scared to hold the bigger bowls by the handles anymore. I've superglued the handle back on, but honestly for the price of these bowls I would've expected them to last longer than 6 months. Otherwise, they're really pretty and functional bowls. Highly functional and great for everything. The pour spout is a great feature. It's not just a tiny V shaped area that doesn't work like most mixing bowls. My only concern is the handle seems really fragile. I am too scared to nest the bowls in storage because the handle hits first when nesting. These are simply gorgeous bowls but the handles of the smaller two bowls snapped off when storing them - not when using them as intended. I am a pottery nut and would replace them if I thought they would hold up better. Lovely, but a word of caution. I really loved these bowls, and was using the small bowl almost daily for fruit. However, within a few months the handle broke off when being put away--it was not being treated roughly and it was quite the surprise. Shortly thereafter we used the larger bowl for mixing pancake batter and later noticed that the kitchen counter had scratches where we'd been working. I then found a rough spot on the bottom of the bowl--a little ceramic speck that is part of the bowl. I'll try to sand it off but I'm not sure if that will work. One other thing to note is that you need to use a plastic or wooden spoon when using as a mixing bowl. The sound of a metal spoon on the surface is like fingernails on a chalkboard! I really really love the way these bowls look, but here I am 6 months after purchase and can't use either one. I can leave the bowls on the counter so they are easy to grab because they are decorative as well. I mix in them and have even served from them. They are easy to clean too!! I use one of these bowls everyday.